In Tamasheq, the language of the Tuareg people of northern Africa, the word emmaar speaks of two sides of the same coin: one nourishing, the other destroying. “Emmaar” means “what you can feel when you are very close to a fire,” says Tinariwen multi-instrumentalist and vocalist Eyadou Ag Leche via e-mail, through a translator. “It is both pleasant and dangerous. Closer, you get burned; adding distance, you can’t feel the heat anymore. “It’s also a metaphor of the current situation at home, between war and peace,” he adds—and it’s the title of the Tuareg rock band’s latest full-length album, released in February, as well. Home, for Tinariwen, is their beloved Sahara Desert, where the historically nomadic Kel Tamasheq, aka Tuareg, tribes have lived since as early as the fifth century B.C. Recent decades found the Tuareg in what is now northern Mali, but after Mali declared its independence from France in 1960, political turmoil in the area forced many Tuareg people to relocate to cities. The Tuareg were displaced to countries including Algeria, Niger, Chad, Mauritania and Libya; it was in a Libyan refugee camp that Tinariwen was formed in the ’80s. Influenced by the Western music that Tinariwen’s founding members—guitarists/vocalists Ibrahim Ag Alhabib, Abdallah Ab Alhousseyni and Alhassane Ag Touhami—were eventually exposed to (namely, Jimi Hendrix and American blues), the band’s entrancing sound was created by blending traditional Tuareg music with electric guitar. When revolution ignited in Mali, Tinariwen joined in the fight for Tuareg independence. After the fighting died down, at least for a while, Tinariwen devoted themselves fully to their music. In the ’90s, the three original self-described “soul rebels” of Tinariwen were joined by a new generation of musicians, including Ag Leche, who had grown up listening to the band’s music. Today, the situation in Mali remains unstable. When it came time to record Emmaar, “we couldn’t record at home as the situation was too unsafe for our crew,” Ag Leche says. So, for the first time, Tinariwen made an album outside of Africa, in an unfamiliar desert on the other side of the world. Despite being influenced by Western music, Tinariwen wanted to get back to their musical roots of a distinctly Tuareg sound on Emmaar. “We wanted to record and get the sound of our debut, the rough guitars sounding, with our low-battery amps in the desert, and thanks to the good gear in America, we were able to produce that sound,” Ag Leche says. The emotions that come through most strongly on Emmaar, though, are longing and homesickness. Tinariwen calls such a feeling of nostalgia assouf, which Ag Leche says “can be compared to the blues” and is also the band’s term for their sound. 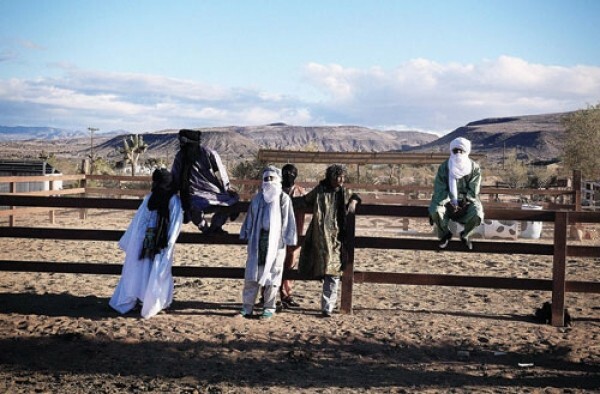 No matter where Tinariwen may wander, they are always connected to their home through their “assouf”—their desert blues. Saturday, April 12, 9 p.m.